The Fantasia Recollections of Ireland, Op 69, was written shortly after Moscheles’ three-week visit to the country in January 1826. He describes the prolonged and terrible crossing from Holyhead to Dublin in an intensely graphic passage from his diary – in the howling storm, as sea-water hissed into his cabin, he put his faith in an Almighty Providence and thought calmly of his sleeping wife and baby – ‘they will either see me again and rejoice, or bear my loss with the help of God’. His profound gratitude for a safe arrival, and his consistently enthusiastic welcome, seem to have lent a special warmth and ebullience to this work. As his appearances there generally concluded with an improvised ‘Fantasia on Irish melodies’, this published piece is no doubt a development and distillation of some of the best ideas that came to him on those occasions. According to the expected norm for such fantasias, there is a stately orchestral opening where coming melodies are lightly hinted at. The piano then enters in concerto manner, with alternately vigorous and expressive, and finally virtuosic development of the same material, with echoes of a well-known tune hovering ever closer to the conscious ear. After a Beethovenian double-trill climax, the piano emerges sweetly with the famous ‘Groves of Blarney’, probably better known today as ‘The Last Rose of Summer’. The tasteful ornamentation is well suited to the tune’s simple pathos. But it is repeated in a totally different guise of softly rippling arpeggios, and this new mood continues rising and falling until resolving into an allegretto whose descending octaves soon turn into the cheerful and debonair Redcoat tune ‘Garry Owen’. As the piano discovers ever more inventive variants, the pace lightly and imperceptibly quickens, until we reach the last of the three melodies, the lovely and warm-hearted ‘St Patrick’s Day’. 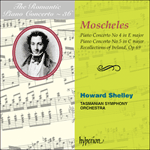 But Moscheles cannot resist the pleasure of combining these two tunes – as the bassoon repeats ‘St Patrick’s Day’, ‘Garry Owen’ re-enters above it. Could this interweaving of the Redcoat march with ‘St Patrick’s Day’ represent the aspiration of the intensely peace-loving Moscheles for the two disparate elements of the Irish nation to live united in harmony? Finally ‘The Groves of Blarney’ returns embroidered with both the other tunes in a sort of miniature Ivesian soundscape, and the music drives joyfully to a traditionally ebullient conclusion. Moscheles, qui composa la Fantasia Recollections of Ireland, op. 69, peu après un séjour de trois semaines en Irlande (janvier 1826), décrit la longue et terrible traversée de Holyhead à Dublin dans un passage très imagé de son journal: au cœur de la tempête mugissante, lorsque l’eau de mer s’insinua, avec force sifflements, à l’intérieur de sa cabine, il s’en remit à une toute-puissante Providence et songea paisiblement à sa femme et à son bébé endormis – «soit ils me reverront et s’en réjouiront, soit ils supporteront ma perte avec l’aide de Dieu.» La profonde gratitude que lui inspira le fait d’être arrivé sain et sauf, mais aussi l’accueil constamment enthousiaste qu’il reçut, semblent avoir conféré à cette œuvre une chaleur et une exubérance particulières. Comme Moscheles achevait généralement ses représentations irlandaises sur une «Fantasia on Irish Melodies» improvisée, la pièce publiée est trés certainement un développement, une distillation de quelques-unes des meilleures idées qui lui sont venues en concert. Comme le veut la norme pour ce genre de fantaisies, une ouverture orchestrale majestueuse débute l’œuvre; les mélodies à venir sont légèrement insinuées. Le piano fait alors son entrée comme dans un concerto, avec un développement du même matériau tour à tour vigoureux, expressif et, pour finir, virtuose, renfermant des échos d’un fameux air qui s’approche toujours plus près de l’oreille en alerte. Passé un apogée beethovénien en doubles trilles, le piano émerge en douceur avec le fameux «Groves of Blarney», probablement mieux connu aujourd’hui sous l’appellation «The Last Rose of Summer». L’ornementation raffinée convient bien au pathos simple de l’air. Mais ce dernier est repris sous un dehors totalement différent, fait d’arpèges doucement ondoyants, et cette nouvelle atmosphère continue de monter et de descendre jusqu’à se résoudre en un allegretto dont les octaves descendantes se muent bientôt en l’air du soldat anglais, enjoué et débonnaire, «Garry Owen». À mesure que le piano dévoile des variantes toujours plus inventives, l’allure s’accélère légèrement, imperceptiblement, jusqu’à nous faire atteindre la dernière des trois mélodies, la charmante et chaleureuse «St Patrick’s Day». Mais Moscheles ne peut résister au plaisir de combiner les deux airs: quand le basson reprend «St Patrick’s Day», «Garry Owen» entre de nouveau, par-dessus. Cet entrelacement de la marche du soldat anglais avec «St Patrick’s Day» pourrait-il symboliser l’aspiration de Moscheles, pacifiste dans l’âme, à voir les deux éléments disparates de la nation irlandaise vivre unis, en harmonie? Finalement, «The Groves of Blarney» revient, enjolivé par les deux autres airs en une sorte de paysage sonore miniature à la Ives, et la musique s’en va gaiement vers une conclusion traditionnellement exubérante. Die Fantasia Recollections of Ireland [„Erinnerungen an Irland“] op. 69 entstanden kurz nach seinem dreiwöchigen Aufenthalt in dem Land im Januar 1826. In seinem Tagebuch beschreibt Moscheles die lange und furchterregende Überfahrt von Holyhead nach Dublin in sehr intensiver und graphischer Weise – in dem heulenden Sturm, als das Seewasser in seiner Kabine brauste, vertraute er sich dem allmächtigen Schicksal an und dachte ruhig an seine schlafende Frau und Kind – „sie werden mich entweder froh wiedersehen, oder meinem Verlust mit Gottes Hülfe ertragen“. Seine tiefe Dankbarkeit für die sichere Ankunft und der herzliche Empfang, der ihm allseits bereitet wurde, scheinen dem Werk eine besondere Wärme und Überschwänglichkeit verliehen zu haben. Seine Konzerte in Irland endeten zumeist mit einer improvisierten „Fantasia über Irische Melodien“ und das herausgegebene Werk ist zweifelsohne eine Weiterentwicklung und Zusammenfassung der besten Ideen die ihm bei jenen Konzerten gekommen waren. Entsprechend der zu erwartenden Konventionen bei solchen Fantasien beginnt sie mit einer stattlichen Orchestereinleitung, in der später erklingende Melodien antizipiert werden. Darauf setzt das Klavier wie bei einem Solokonzert ein und spielt eine abwechselnd lebhafte und expressive und schließlich virtuose Durchführung desselben Materials, wobei dem aufmerksamen Ohr Anklänge an eine bekannte Melodie näher und näher kommen. Nach einem Beethovenschen Höhepunkt mit einem Doppeltriller erklingt auf dem Klavier die anmutige und berühmte Melodie „Groves of Blarney“, die heutzutage wahrscheinlich eher unter dem Titel „The Last Rose of Summer“ bekannt ist. Die geschmackvolle Ornamentierung passt gut zu dem schlichten Pathos der Melodie. Dann erscheint sie jedoch in völlig anderer Form in leise gekräuselten Arpeggien und in dieser neuen Stimmung schwingt sie auf und ab, bis sie sich in ein Allegretto auflöst, dessen absteigende Oktaven sich bald in das fröhliche, flotte Rotrock-Lied, „Garry Owen“ verwandeln. Vom Klavier erklingen immer mehr einfallsreiche Varianten und gleichzeitig wird das Tempo leicht und unmerklich beschleunigt, bis wir bei der letzten der drei Melodien ankommen, dem netten und warmherzigen „St Patrick’s Day“. Moscheles kann jedoch dem Vergnügen nicht widerstehen, die beiden Melodien miteinander zu verbinden: wenn das Fagott „St Patrick’s Day“ wiederholt, wird darüber mit „Garry Owen“ eingesetzt. Könnte diese Verflechtung des Rotrock-Marschs mit „St Patrick’s Day“ das Bestreben des sehr friedliebenden Moscheles symbolisieren, die beiden disparaten Teile der irischen Nation dazu zu bringen, harmonisch miteinander zu leben? Schließlich kehrt „The Groves of Blarney“ verziert zurück, wobei die beiden anderen Melodien in einer Ives-artigen Klanglandschaft erscheinen, und die Musik bewegt sich fröhlich einem traditionellen, überschwänglichen Ende entgegen.